Everything evolves rapidly nowadays, and so does the Mac video converters. Maybe the program which has been rated the best in 2018 is not as handy as before since the overdue updates, frequent bugs, or some other factors. Therefore, it's quite crucial to find the best video converter Mac 2019 to offset the possible inconveniences of your previous one and catch up the new features of Mac High Sierra. Then here comes the issue: what's the best tool to convert HD/4K videos on Mac in 2019? How do you evaluate a video encoder/decoder for good or ordinary? Well, being the best video transcoder in 2019 at least should be safe and clean enough, compatible with the latest macOS High Sierra, ease-to-use, fast and supportive to a wide range of audio video formats and profiles. What's the Best Video Converter Mac in 2019? 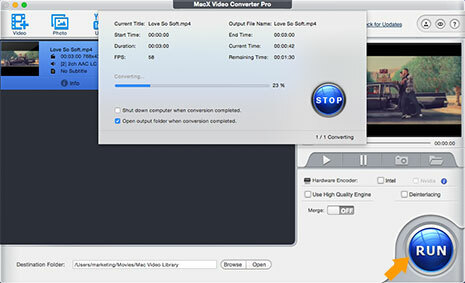 MacX Video Converter Pro is absolutely the anser with its security and easy-to-use. It converts any SD HD videos on Mac (macOS High Sierra incl.) with 16X faster speed and almost original video audio quality reserved. 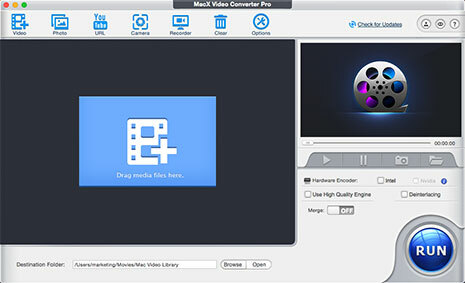 Given all that MacX Video Converter Pro can be competent as one of the best video converter Mac 2019. Built in 320+ video and 50+ audio codecs, it converts any videos from format to format, like MKV to AVI, AVI to MP4, M2TS to FLV, AVCHD to HEVC etc. No matter you wanna upload your recordings to web, share videos with friends, enjoy the UHD HEVC videos on iPhone 8/X, or get your videos in the pocket, it can make things done! The program presets almost all popular profiles as output, namely iPhone 8/X, iPhone 7/6S/SE/5S/5, iPad Pro/Air, Android tablets and phones, or game console etc. So, you don't need to make complicated presets setting to convert video to iPhone X/8 like what you do with Handbrake. MacX enables you to convert videos 5 times faster than others thanks to the multi-core utility, and hyper-threading tech, and 16X faster with Intel Quick Sync Video hardware acceleration supported. That is to say, if you convert videos to H.264, H.265 codec, you can benefit from the Intel QSV tech to fulfill the conversion 16X faster. With the high quality engine supported, MacX ensures the best video quality output. According to a video conversion comparison test we've made before, it produces a MP4 file with exactly 1280x720 the same resolution and higher bit rate up to 2901 kbps, while Handbrake exports at 2814 kbps at the same resolution, format. Still, the HD video converter updates constantly to fix the minor bugs and the newly compatibility of macOS High Sierra. Besides, it's also one of the programs that updates rapidly to be compatible with the new macOS, or flagship devices. Last but not the least, this 2018 best video transcoder for Mac works stable and has no adware, no malware. 100% security ensured. Moreover, it delivers a super ease-to-use and intuitive interface, so that you're able to convert videos on Mac through drag and drop within 3 steps only. How to Convert Videos with 2019 Best Video Converter Mac? Of course, free download the program and launch it on your Mac computer come to the initial steps. It's compatible and runs well on Mac OS X 10.6 or above, including macOS High Sierra. BTW, if you want to convert videos on PCs, you can also grab the Windows version as well. Load the target video you wanna convert. 3. Click on the blue area on initial page and choose your video from the popped up window. After video loaded, there pops up a window for video output format selection. All video formats/codec and popular profiles are available for you. 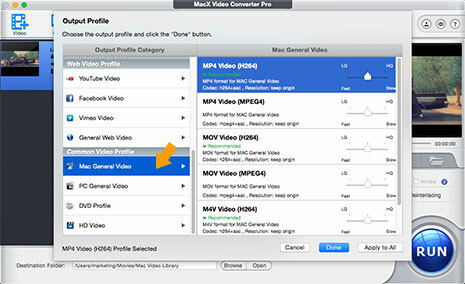 You're suggested to convert video to MP4 (Choose Mac General Video > MP4) for watching on your Mac computer; or directly go "Apple Device" > "to iPhone Video" to choose iPhone 8/X/7 Plus/6S/5 and get your video into pocket. Convert Videos on Mac now. Simply tap the blue "RUN" icon on the lower right corner. And you will be shown with a converting progress bar, which tells you're converting video now and able to pause or cancel as you like. BTW, your video conversion will be accomplished within fast speed. It all depends on the video size, length, your computer hardware and so on. Rated as the best video decoding and encoding software on MacOS. It converts any SD HD videos with good quality, 5x faster speed than other competitors. No size limits, no ads, no plugin, no extra software.